Waterproof to 3ft. for up to 30 min. The Galaxy S5 is Samsung's flagship smartphone for a reason. It includes all of Samsung's greatest features, including a 16-Megapixel camera, Full 1080p Touch LCD screen, and quad-core processor. The 16-Megapixel camera is one of the best that we have seen on a smartphone and will do well for you in well-lit situations. You are looking for one of the best available smartphones on the market for photo taking. It works well in place of digicam and provides you with image sharing no matter where you are. 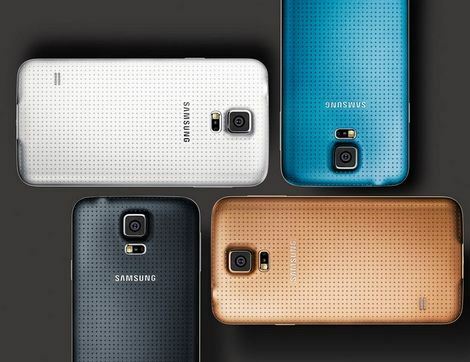 Samsung's flagship smartphone, the Galaxy S5, is an incredibly powerful and useful device. Sporting a 2.5GHz quad-core processor, 16-Megapixel main camera, 2-Megapixel front-facing camera, GPS, WiFi with NFC and a 5.1-Inch full 1080p HD touch screen, this phone's rival most others that you will find on the market. Samsung designed the phone to survive most everyday situations as well, giving it a waterproof seal around the back case and charging port that allow in to survive under water up to 3ft. for up to 30 minutes. This is great for the numerous situations in which a phone has wound up ruined from water damage. They have even loaded the phone with just about every type of sensor you can think of to assure that it can do anything you want, including a fingerprint scanner for increased security. Focusing on the camera aspects of the phone, images are captured with a 16-Megapixel CMOS imaging sensor and a processor as powerful as most laptop computers. This allows the camera to feature an advanced AF system that utilizes touch-to-focus, Face Detection and Selective focus options to assure you get the best focus possible in a variety of situations. Burst shooting, image stabilization and shooting effects are also included that rival or surpass what you will find on most compact digicams. The front-facing camera allows for dual image shots and face-to-face video capabilities like Skype. The Galaxy S5 even outdoes most digicams in the video department with its ability to not only capture full 1080p HD video but Ultra High Definition (4K) and slow motion HD video as well. Shooting with the S5 is just as easy as using any other compact digicam. You have the option to choose one of the many automatic shooting modes, including the "Auto" mode that has its own scene selection capabilities. The auto focus and metering, along with Face Detection provides the accuracy that you expect from a good camera. The shutter release can be operated either on the touch LCD or via the volume buttons on the side of the phone, which is another way to give the phone a camera-like feel. Even the advanced shooting modes like HDR capture and panoramic shooting are no problem for the phone with its powerful processor. There are only a few things that the phone is missing that separate it from a digicam, an optical zoom, a decent flash unit and a handgrip. Looking at our outdoor sample images, we see that the small image sensor produces excellent results in our well-lit situations. The phone produced excellent exposures and vivid colors for an overall excellent image. We also found a lot more detail within the images than we expected to. The biggest thing you will have to get used to with the phone is moving your body to get the composition that you are looking for instead of using the zoom. There is a digital zoom of 4x, but the image quality will suffer greatly if you use it. We were a little disappointed with the 16-Megapixel image only being in the 16:9 format, and dropping down the 12-Megapixel for a 4:3 format image. All of our samples were captured in full 16-Megapixel format, but due to the aspect look a little different than what we are used to posting as our samples; typically, cameras output photos in 4:3 aspect. Our indoor sample images show us what happens with the small image sensor in a reduced light setting. A small sensor does not collect light as well as a larger sensor (found in digital cameras), and the results are easily visible with our M&M man shots. The image using the flash did pretty well, keeping a sharp and well exposed image that shows a good deal of detail. It is not near as sharp as our outdoor images, but again a little better than we expected. This will only happen if you keep the phone close enough to your subject for the flash to have good effect, usually within a few feet. Without the flash the results were closer to what we expected, losing some detail and sharpness to increased noise and blotchy areas due to higher ISO settings. This is definitely not the camera you will want to have for low-light shooting situations. The S5's portraits and custom shooting modes are easy to use and fun. Shooting portraits is fast and easy with the accurate Face Detection software. As long as it is turned on, it works in most of the camera's shooting modes, including Auto. You can also choose one of the specific modes like Beauty Portrait. Some of the other specific shooting modes are far more creative than you can imagine, allowing you to even create a virtual tour of your house. Capture a surround shot of an entire view, not just a vertical or horizontal panorama. Even an animated image is possible where you select the parts of an image that you want frozen and which parts to be animated. There is also a fantastic collection of effects and editing capabilities that can be applied to your images after they are taken. The S5 may even offer more options than your home editing suite, especially when you consider third-party apps on the Google Play store. Video capture starts recording with just tap of the video button in the camera shooting mode. The same button that switches to the video mode also starts the video recording, so you don't have to worry about missing a thing. In the normal capture modes, the S5 produces excellent videos in both UHD and Full HD resolutions. The Full HD videos are very pleasing when played back on the phone or a computer, with smooth playback and sharp video. Due to the lack of a 4K viewing source, we cannot comment on the playback of the UHD video. Video stabilization is available for 1080p and lower resolution settings, as well as some slow motion video options. Our slow motion video sample playback is also very smooth, but the video is interlaced and shows apparent lines throughout. Audio is recorded with the built-in mic, which handled the outdoor situation much better than most digicams. Powering the S5 is a 3.85V, 2800mAh rechargeable Li-Ion battery. Samsung is one of the few that still uses a replaceable battery, so it is possible to have a spare or replace a battery when its life starts to dwindle. Our time with the phone has shown us an excellent battery life, although we are not able to relate it to images captured since it is always on and running. If this is going to be your main source of communication and source of photography on a trip, you will want to have a portable USB charger handy, as the battery can go fast when the LCD screen is kept on. Bottom Line - While we have not yet found a smartphone that has all of the features to completely replace a compact digicam, the Samsung Galaxy S5 truly shows how close they are coming. With a 16-Megapixel CMOS imaging sensor, incredibly powerful processor and all of the auto features offered by a digicam, the S5 will serve you well in most shooting situations. Your major obstacles will be the lack of a good flash and optical zoom, but they are able to be overcome most of the time. Available from most cellular carriers, you should have no problem getting your hands on a Galaxy S5 for a good price.